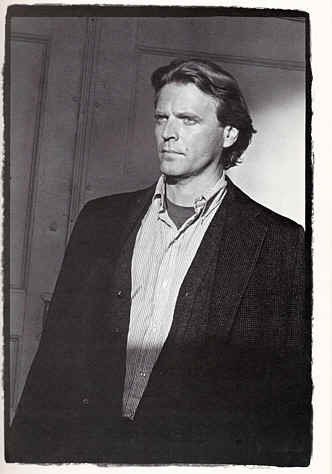 David Rasche is the sort of actor who makes you appreciate supporting players -- those characters in a movie or a play that you don't pay much attention to until the focus suddenly shifts to them and they become, however briefly, the only thing happening. The actor in that situation has to work harder than the star, in some ways, because he has only a few lines or one dramatic action through which to convey an entire life. Perhaps because of his background doing improvisational comedy in Chicago, Rasche has the subtlety to recede into the background and the substance to make an impression quickly -- as when he played the stunt man in Jonathan Reynolds' farce Geniuses, who suddenly turns and beats a starlet nearly to death. You've been working like crazy in the last several months. I have. I did a play at the Second Stage, then a Miami Vice, and then I did a little part in this new movie with Sylvester Stallone. I was an innocent bystander brutally murdered by an ax. Yes, I know. It's a difficult business. I guess I did. I've always been involved in the theater. My father's a minister, so my whole childhood was involved with the church and politics. I spent a couple of years in divinity school at the University of Chicago. I sort of treated it like a monastery, which it isn't, so it didn't work. It's really for people who already know what's going on so they can learn how to tell other people. It's not for those who are just lost. I had to write a paper on Paul Tillich -- eight pages of what Paul Tillich said, and then the next eight pages were supposed to be what I thought. I wrote the first eight, and that's all I could do. I think it's hard to figure out what's going on. Don't you think so? I just didn't have much to say. And I was twenty-five at the time. I had already gotten a master's degree in English at the University of Chicago and taught for a year at Gustavus Adolphus College in Minnesota. Then I came back to divinity school for two years. After that I didn't do anything for a year. Then I started going to Second City and taking workshops. A typical story. What made you go to Second City? I wanted to be Mike Nichols. I didn't want to be an actor, I wanted to be him. I like satire. The summer after my senior year, I worked on a boat in the Great Lakes, and I used to rip off Mike Nichols and Elaine May routines, inflection for inflection. In the evening, the college students who worked on the boat gave a little show for the people. I'd corral these waitresses and sit them down next to the record player and make them talk exactly like Elaine May. I really loved Nichols and May. Then I heard you could sign up for workshops at Second City, and I thought, "My God! You mean, they'll take anybody? All you have to do is give them $60?" I was afraid to go alone, so I paid the tuition for a friend to go with me. When I first went, I knew that's really what I wanted to do. I didn't necessarily want to be an actor. At that time, you know, actors were pretty silly at Second City -- "Acting? You must be kidding!" But it was a lot of fun. You get to the theater at eight-thirty, start laughing, and continue to laugh until around one or two in the morning. You can't beat it. What's the best thing about being an actor for you? Well, you know, sometimes you're forced to climb in bed with women who have no clothes on, and you have to do it. You have to, even though you're married. You must do it. I did this play called Lunch Hour, and I was only in the second act, so I had a lot of time to wait. But I used to like to watch the curtain go up. It was such a fascinating thing every night. It's like there was this secret. The people in the audience knew there was something behind that curtain, and they didn't know what it was, but they were willing to pay to find out. So they give $40 and say, "Okay, now, come on, show us." And we're backstage going, "So I said, 'Look, Mike, I have a flat tire, won't you help me with it?'" Then the stage manager says, "Time for the curtain," and you go, "Okay, okay." And then there's a moment where the audience is quiet, and the actors are quiet, and everybody's waiting for the secret. We're going to show them the secret -- they gave us $40, right? It's time. The reality of help-me-with-my-car is gone, the reality of people taking off their coats is gone, and they merge. I'd go down there and wait for everything to get quiet, the lights go down, then there's this sound whhhhhhh. The curtain goes up, the lights go on, and something begins. It's fascinating.